1942 LAGER GMÜND III. 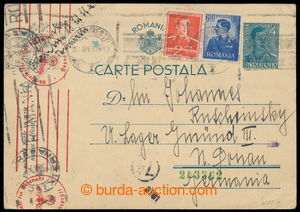 (České Velenice) uprated Rumanian PC sent to member of assembly camp, who was set up in occupied České Veleníce (Czechland) as transit camp for Hungarian Jews, posting MC BUCHAREST 8.Apr.42, Romanian also German censorship; good condition, rare! 1939 [COLLECTIONS] big collection issue Landscape, castles and town the first issue., Pof.28-40, contains blocks of four, coupons, gutter-pair, plate number and plate mark, shades etc.., placed in 5 big stockbooks, contains i.a. 1 Koruna Prague plate number 3, 3A 23 pcs of bloks of four, all variants coupons with plate mark + or *, flaw print, color shades etc..; mainly perfect condition, cat. min. 51.000Kč, rare collection with lot of duplication! 1939 SMÍŠENÁ FRANKATURA DOPLATNÍCH ZN. letter franked with. Czechosl. stamp. 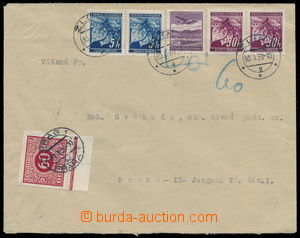 Štefánik 60h violet, Pof.302, CDS out of stmp PRAGUE 25/ 23.XII.39, at the delivery place burdened by surtax 1,20 Koruna in Czechosl postage-due stamp., refused, sent back and on reverse mounted Bohemian and Moravian Postage due stamp 60h 2x, CDS PRAGUE 51/ 28.XII.39; hints of ungentle opening envelope/-s, interesting mixed franking Czechosl. parallel and Bohemian and Moravian postage-due stamps! 1941 Pof.SL7, Official the first issue 1,20 Koruna red, L the bottom corner piece with plate number 3-41 and with protective frame; sought by specialists, cat. Pofis this variety doesn't report!